Kāne – Hawaiian god of the forests and the trees. Kane is the leading god of the great gods named by Hawaiians and represented creation. He is associated with dawn, the sun and the sky, and also with life-giving water, lightening and rainbows. Kū – Kū is commonly known as the god of war, however, he is also the Hawaiian god of prosperity, the deep forest, the mountain, dry and wet farming and fishing. He is associated with the East (sun rising) and things that are male or upright. Kanaloa – Hawaiian god of ocean and the land of departed spirits. Lono – Lono is the Hawaiian god of peace, fertility, agriculture, rainfall and music. Many of the significant sites and heiau (places of worship, religious sites) you will see here in Waimea Valley are dedicated to these gods. Waimea Valley is an ahupua‘a, a division of land stretching from the mountains to the sea. If you imagine the island like a pie, each slice is an ahupua‘a. 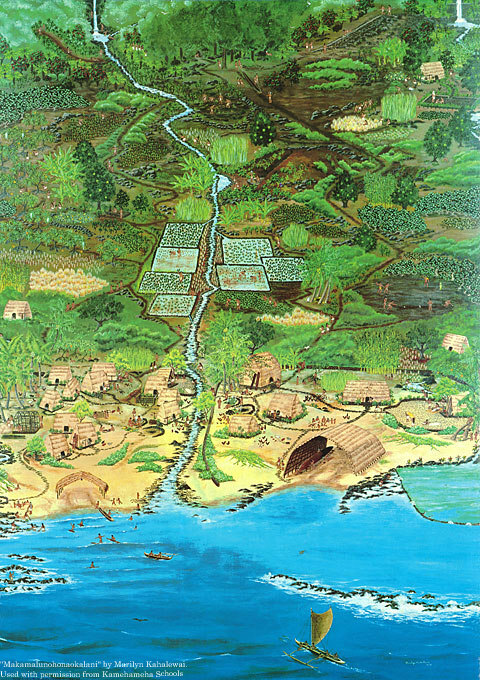 Land was divided this way in early Hawai‘i for many reasons however, the most important reason was to ensure each community within the ahupua‘a had the resources they needed in order to survive. Resources are found at various elevations and places within each ahupua’a. For example, from the uka (uplands) region, plants that provide medicines are found. Trees for constructing wa‘a (canoes) and hale (houses and other structures) are harvested here. Birds are caught and released for making hulu (feather) adornments. The kula (plains, midland) region is where most agricultural crops are farmed such as mai‘a (banana), kalo (taro), ‘ulu (breadfruit), ‘uala (sweet potato) and niu (coconut). The kai (seaside) region provided food and other resources from the ocean, including i‘a (fish), he‘e (octopus), pūpū (shells), limu (seaweed) and pa‘akai (salt). Hawaiians were traditionally masters at resource management and were able to sustain themselves from the bounties provided by the land and sea for many generations. Unique to Hawai‘i were loko i‘a (fish ponds). Areas of brackish water where streams met the sea were surrounded by pohaku (rocks), which created ponds. Limu (seaweed) grows great in the shallow, brackish water and prized fish such as mullet swam through the cracks in the walls or slats in a gate system to feed. Once too large to escape, the fish were gathered. This form of aquatic farming (aquaculture) continues to be practiced today. 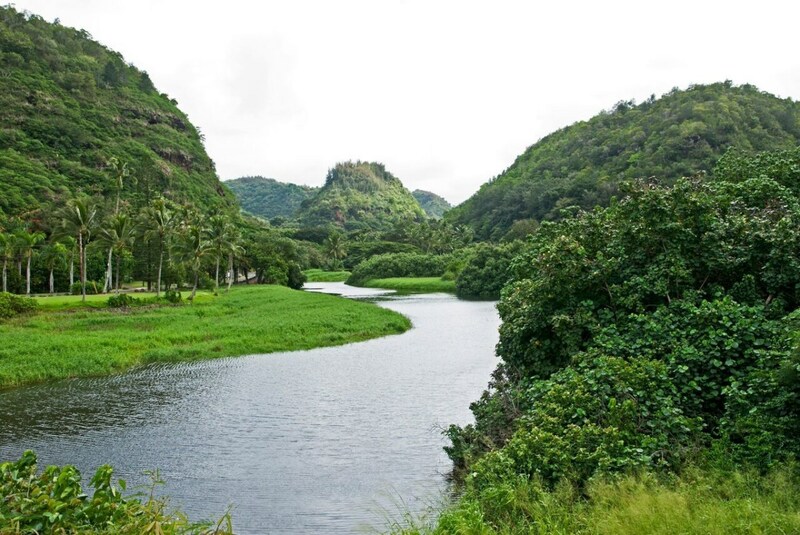 Waimea Valley has gone through many changes throughout history. After Kamehameha the Great conquered O‘ahu in 1795, he recognized the importance and value of Waimea Valley and awarded it to his most trusted spiritual advisor, Hewahewa Nui. Waimea was chosen because of its abundant resources and geographical location on O’ahu. About seven years after the death of Kamehameha in 1819, Hewahewa came to live at Waimea and ruled as its chief. During this time, much change was happening in Hawai‘i due to powerful foreign influences. The traditional kapu (rule) system of laws had begun to crumble. Hewahewa, along with Kamehameha II and Ka‘ahumanu (his co-ruler), converted to Christianity, denounced Hawaiian gods and aided in ordering all heiau and religious idols destroyed. Upon Hewahewa’s death in 1837, Waimea Valley was awarded to his granddaughter Pa‘alua. Following the Mahele Land Redistribution Act in 1848, the newly formed Land Commission offered to give her ownership of about half of the Valley on condition that she give up any claim to the rest. She was able to hold on to her land until 1884 when high debt forced her to mortgage and lease the land. This was a very hard time for Hawaiians because they believed they were part of the land. Many did not understand the Western definition of land ownership. Her property was foreclosed after her death in 1886. Ownership of the Valley changed hands many times at public auction over the next 20 years and by the turn of the 20th century was under the control of the Castle & Cook pineapple and sugar company. In the early 1900’s Waimea was used for ranching and farming and many other outside entities such as Japanese farmers and the U.S. Military occupied the Valley. In the 1960’s and 1970’s Waimea was operated commercially as the Waimea Falls Ranch and Stables, which offered 75-cent stagecoach rides along with actors who rode along playing cowboys and Indians. It was at this time visitors could participate in guided tours and attend cliff-diving and hula shows. 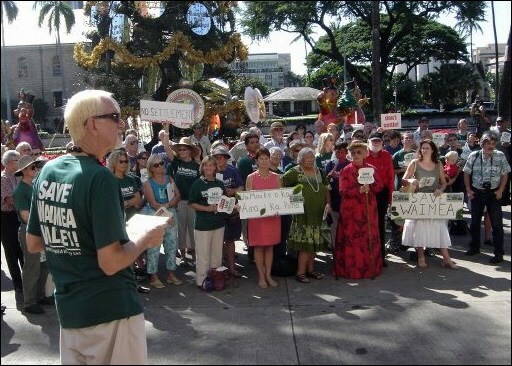 In 2003, with a collaboration between the City, the State Department of Land and Natural Resources, the U.S. Army and the Trust for Public Lands, and the Office of Hawaiian Affairs, Waimea Valley is now back in the hands of a Native Hawaiian governing entity, and is owned and managed by Hi‘ipaka LLC, a non-profit, limited liability company created to nurture and care for this treasure. Today, the mission of the Valley is to “Preserve and perpetuate the human, cultural and natural resources of Waimea for generations through education and stewardship”. As you visit the Valley, in respect to the beliefs of the ancient Hawaiians and those descendants who today carry out the duty to restore and protect the significant and religious sites here, please be mindful and do not touch, disturb, or remove any rocks or other objects out of respect for this truly special place.